I read this book in a day. Do we need to say more about this month’s Duchess Dolls Book Club offering? No kidding, The plan was to sit for a few minutes with a cup of coffee. By sundown I had left the chair only to use the rest room–to freshen my lipstick of course. As a girl who generally would have huge regrets about sitting in a chair all day, I confess to none. Delia Owens Where The Crawdads Sing was worth the bleary-eyed haze at day’s end. 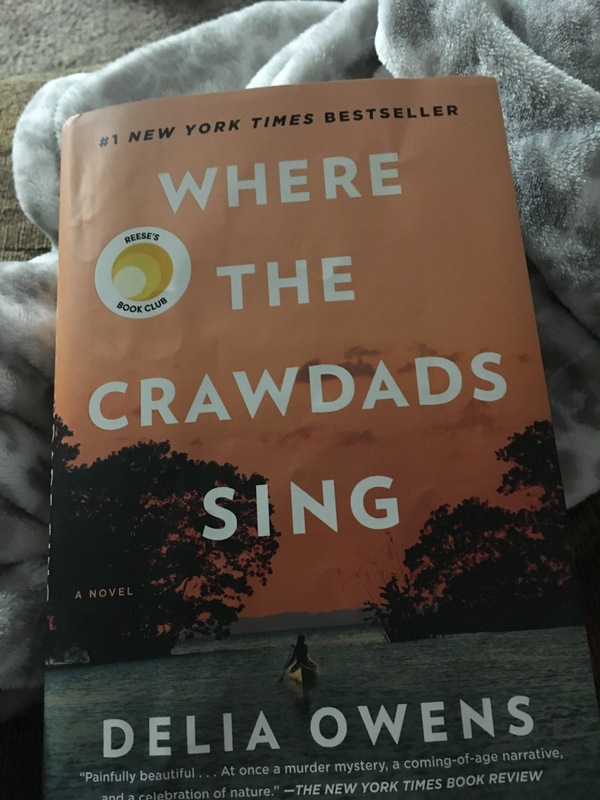 Transported to the North Carolina coast and it’s scary marshlands, the adventure, the heartbreak and the journey of an abandoned child coupled with a murder mystery found me turning pages and yearning for more. Yes, I do want to run away to the backwoods somewhere and find my way back home–to words, to poetry, to love and to the truth of what life should be. It’s a mystery to be sure, but a mystery wrapped in a mystery encased in a love story tied tight with a ribbon of surprise and insight into coming of age, family and the nature of loss, desperation with a badass chick to admire. I know I’m late to the party on this one. It emerged on the scene last year and immediately shot to the top of all the lists. Who wants to read a story about a girl living in the marsh, swirled my thoughts. That it’s written by the author of three nonfiction books about her life as a wildlife scientist in Africa didn’t do much more to pique my interest. Shallow, yes. Unmoving, non. Crawdads is her first foray into fiction and the girl hit it out of the park. There’s plenty of evidence Owens is a zoologist. Her knowledge of the swamps and backwoods is intense, mesmerizing and a little frightening. But her ability to weave an intensely human story through the marshes, waterways and creatures that live there paints a picture so vivid you can hear the birds, the movement of the water and heroine Kya’s heartbeat when danger lurks. Kya, the marsh girl, wraps the reader tightly round her finger. We root for her, cry for her, want to reach into the pages and let our mother love embrace her. And, yes, it’s going to be a movie. Work is underway on the adaptation. But it is a must read before the story hits the screen. Here’s the key: You won’t be able to stop. Whether you play hooky or carve out a Saturday, be ready to wrap up and get lost in the Carolina coast and cast of characters so vivid you come away feeling as if you know them–good and bad. You don’t even need wine with this one, dolls. You can get your copy at Amazon--mine was delivered next day.